ARCTIC has been in the PC cooling business since 2001. Now it has made the significant step of introducing the first all-in-one CPU liquid coolers to its product portfolio. It introduced its first liquid coolers for graphics cards not long ago. A pair of liquid coolers, the Liquid Freezer 120 and Liquid Freezer 240, have now been launched and have become immediately available. For its debut products in this niche ARCTIC has bold claims. The firm says that the Liquid Freezer 120 and Liquid Freezer 240 are "not only the quietest but also the most powerful all-in-one coolers of their class". The coolers are said to be future proofed for overclocked CPUs with up to 16 cores and can comfortably deal with up to 300 watts TDP (250 watts for the Liquid Freezer 120). Looking at the hardware employed in these products ARCTIC's pump consumes 2 watts and works in concert with a concentric CNC finished copper block contact surface. 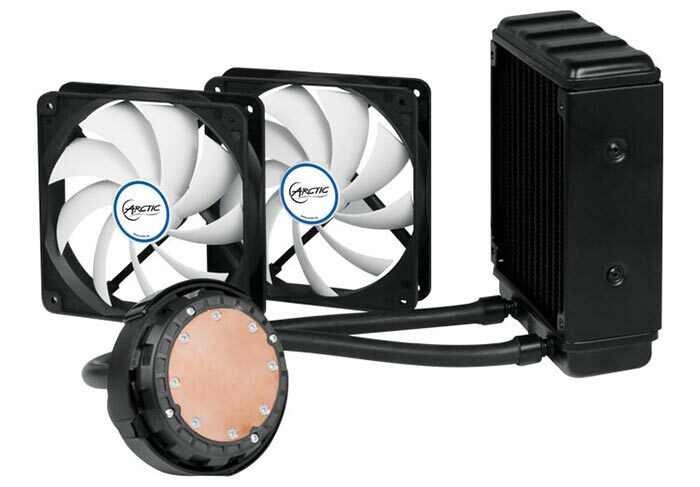 Both coolers use ARCTIC F12 fluid dynamic bearing fans to "offer the highest airflow at a given noise level". With the Liquid Freezer 120 there are two such fans in a push-pull configuration either side of the radiator, the Liquid Freezer 240 doubles everything up - with its 240mm radiator and 4x fans. The F12 fans promise a long service life. 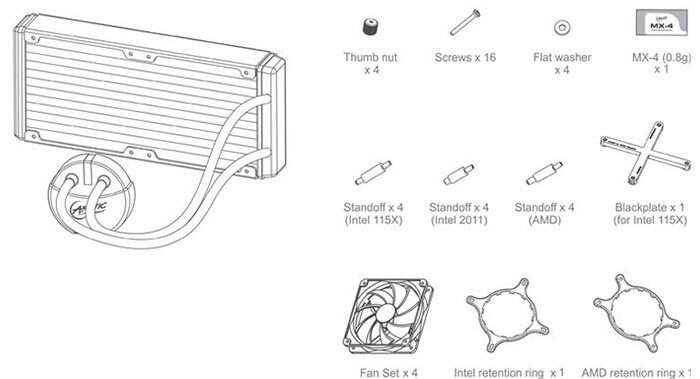 The ARCTIC Liquid Freezer coolers work with both modern Intel and AMD sockets. ARCTIC supplies both styles of fittings in the box with all the necessary bolts, washers, standoffs and a packet of MX-4 thermal compound. You can already save a bit of cash on those RRPs, even with shipping included. Directly from the ARCTIC product pages you can get the Liquid Freezer 120 for £60.99 and the Liquid Freezer 240 for exactly £70 (plus £8.73 shipping in either case). Your purchase will be backed by a two year warranty. I'm considering an AIO for my next (re)build and Corsair's are front-and-centre in my thoughts. However, I'm wondering if Arctic are being a bit crafty by picking the non “i” models of the Corsair range - where the user can control the fan speed and therefore the noise level? The other thing is the warranty - Corsair seem to offer a five year warranty on the models I've looked at, yet Arctic are pleased with their mere two-year “limited” warranty? Where I think Corsair have dropped the ball is the bundled software…I've had nothing but trouble with and I can tell from searching the web that I'm not the only one. I recommend that if you go for Corsair save the money, get a non-i version and use that ASUS fan controller. If you want any further info PM me. Edit: Or I'll post it here…sorry I'm having one of those days. Depends…I moved mine from a “large” Lancool to a “small” LianLi and had no problems but I know that there are a lot of “small” cases where the 240 rad is a right pita…and those hoses are not very flexible.